exposure to exemplary peer performances can undermine motivation and success by causing people to perceive that they cannot attain their peers’ high levels of performance. It also causes de-identification with the relevant domain. pedagogy can be easily overlooked for convenience or cost. as educators I think it is in our best interest to realize that just because one modality provides better instructional or assessment models than another, doesn’t mean people won’t sacrifice out of need. As my favorite boss used to say, products and services are all about Time, Money, and Quality… pick two. Progress updates work. 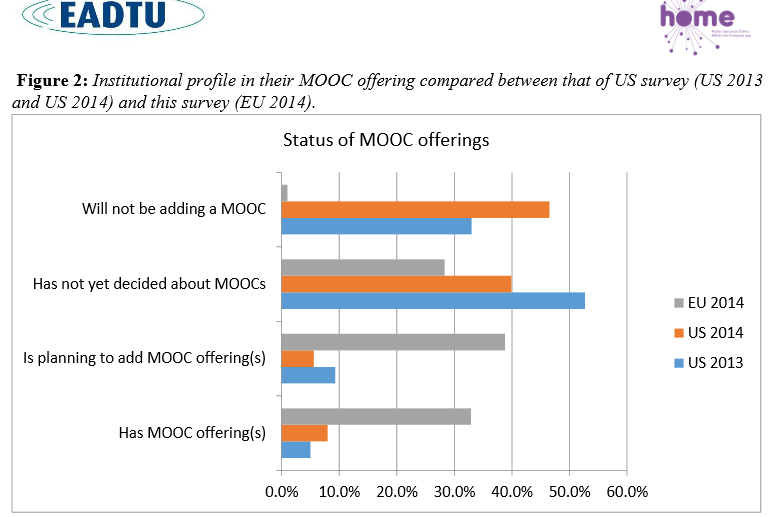 p. 11 What is a MOOC? instrument and as such a concept that should be broadly defined. MOOCs are “online courses designed for large numbers of participants, that can be accessed by anyone anywhere as long as they have an internet connection, are open to everyone without entry qualifications, and offer a full/complete course experience online for free”. Copyright lengths should be shortened. Term lengths like these rarely benefit actual people. They benefit corporations, be it publishers or things like Disney. Karen Lightner: I can see the usefulness of bringing the US into line with the Berne Convention, so that we are in line with other nations’ laws. But the additional 20 years we have added for individuals and the incredibly long period for corporations goes against, I believe, what the founding fathers intended when they specified for a limited time. Edwin A Quist: There are collections of so-called production music issued with licenses to be used for educational videos. We have at least two sets of these in our music library (in various styles: rock ,classical, world, electronic, etc.) — but don’t expect great art! Also WikiMedia Commons has some CC licensed music. Brad Whitehead: I have no quarrel with protecting corporate trademarks — Disney characters or Nike swooshes, etc. — but maintaining monopolies on creative works for such extended periods primarily enriches publishers with no benefit to the creators. Nicholas Theo: There are definitely works created where it can be next to impossible to find the owner, or their descendant 20 years after the creation of the work. I have also witnessed when you do track these people down that they want an exorbitant sum of money for permission to use their creation even when there has been absolutely no interest in it. In the end no deal is made. On the other hand I work with two small non profit organizations whose body of work is of value. The material is actively used, and the body of work is a core asset for the organization. What happens to each organization once the copyrights expire? One organization faces this reality in 2015. The Internet permits an environment where decades of work may be used, and in some instances in ways the original material was never intended to be used. For instance, written passages can be misquoted and there will no longer be a legal mechanism to halt this practice. Karen Case: I would be curious to know if the Youtube video with Mozart would have been removed if the link was made private. Susan Martel: I think about The Hobbit which was published in 1937. The author, Tolkien, died in 1973, and I remember his books being popular in the seventies and the eighties. It was fairly recently that movies were made based on his books. It seems fair (and I hope that it is the case) that he left a great legacy behind to his family so that they could continue to receive income from his work. If Tolkien’s works were in the public domain by the time the movies were made, it is just an easy way for those working in the movie industry to become even wealthier without having to pay anything to the author or his beneficiaries. Not all works have the kind of potential that Tolkien’s did, but without a crystal ball to predict the future it may be difficult to predict accurately what works will have continued success for generations and which will just be a flash in the pan. Charles N. Norton: There is something called “Good Faith” effort that many archives hold to that tends to be the “standard” when trying to use copyrighted material for educational use, but it really only applies when you know who the copyright holder is and for whatever reason they simply do not respond to your requests. It does not remove the authors rights and, in fact, many times one does end up having to remove shared material after the fact because the copyright holders finally does get around to denying permission. Lesli Moore: I’m glad to see some discussion about Open Access to works. Perhaps instead of shortening the term, creators can circumvent the terms by offering open access using Creative Commons. Jef Gielen: There are pros and cons. Do we find it reasonable that heirs take benefit from a work they did not contribute to at all ? To me, this is not evident. On the other hand, the copyright can be in hand of foundations trying to continue the work of an author – e.g. by means of scholarships. That’s another story .. Here is a complete list of all the suggested readings for the Copyright for Educations and Librarians Course. Click here for a downloadable PDF version of the Suggested Readings that contains the full URL links. The Copyright Law of the United States, Title 17 of the U.S. Code. Please scan the section headings to gain a general idea of the structure of the law. Peter Hirtle, Emily Hudson & Andrew Kenyon, Copyright & Cultural Institutions: Guidelines for Digitization (Cornell University Library, 2009). Please read chapters 1 & 2. The Copyright Law of the United States, Title 17 of the U.S. Code. Please read sections 101 through 106 and section 109. United States Copyright Office website, at http://copyright.gov/. Please read circulars 9 (“Work Made for Hire under the 1976 Copyright Act“) and 21 (“Reproductions of Copyrighted Works by Educators and Librarian”). Peter Hirtle, “Copyright and the Public Domain in the United States,” online chart. Peter Hirtle, Emily Hudson & Andrew Kenyon, Copyright & Cultural Institutions: Guidelines for Digitization (Cornell University Library, 2009). Please read chapters 3 & 4. “Copyright Law & Public Domain,” a series of short essays from NOLO, Law for All, at. The Copyright Law of the United States, Title 17 of the U.S. Code. Available at http://www.copyright.gov/title17/. Please read sections 108 and 110. Peter Hirtle, Emily Hudson & Andrew Kenyon, Copyright & Cultural Institutions: Guidelines for Digitization (Cornell University Library, 2009). Please read chapter 6. Creative Commons website at . Please read the “Choose a license” page and “About the Licenses“. Copyright and Fair Use, Stanford University Libraries, “The Basics of Getting Permission” athttp://fairuse.stanford.edu/overview/introduction/getting-permission/. “Permissions,” Copyright Advisory Office, Columbia University Libraries. David R. Hansen, Copyright Reform Principles for Libraries, Archives, and Other Memory Institutions, 29 Berkeley Tech. L.J. (forthcoming 2014). “What Exactly is Music Copyright,” by Joy R. Butler, Esq. There is an A/B comparison of “He’s So Fine and “My Sweet Lord” played simultaneously on separate channels. The Copyright Law of the United States, Title 17 of the U.S. Code. Available at http://www.copyright.gov/title17/. Please read section 107. Kenneth D. Crews, Copyright Law for Librarians and Educators: Creative Strategies and Practical Solutions, 3rd edition (Chicago: American Library Association, 2012). “Code of Best Practices in Fair Use for Academic and Research Libraries.” Association of Research Libraries and the Center for Social Media, American University School of Communication. “Code of Best Practices in Fair Use for Media Literacy Education.” Temple University Media Education Lab, American University Washington College of Law Program on Information Justice and Intellectual Property, and American University Center for Media & Social Impact. issues related to MOOCs, such as intellectual property rights, privacy issues, and state regulations. The MOOC movement might change this copyright-ownership contract between university and faculty. Stephens, M. m., & Jones, K. L. (2014). MOOCs as LIS Professional Development Platforms: Evaluating and Refining SJSU’s First Not-for-Credit MOOC. Journal Of Education For Library & Information Science, 55(4), 345-361. Learning 2.0 programs, also known as“23 Things,” have offered online technol­ogy-focused professional development for library staff and could be considered an early version of LIS-focused MOOCs (Stephens, 2013a). Utilizing concepts such as self-directed learning, play, and an emphasis on lifelong learning, these pro­grams have been offered for individual li­braries as well as consortial and state level iterations to reach thousands of library staff. utilizing concepts such as self-directed learning, play, and an emphasis on lifelong learning, these pro­grams have been offered for individual li­braries as well as consortial and state level iterations to reach thousands of library staff. Benefits to staff include increased comfort with emerging technologies and an increased desire to continue learning (p. 348). Bryan Alexander forwarded the idea of swarming in education some 10 years go: synchronous online communication will break the brick-and-mortar classroom and must lead to offering a f2f class on a specific subject to “swarming” of interested students all around the globe around the specific subject. It was in an Educause article, which, of course, I cannot find now. The term comes from the 1999 riots in Seattle when protesters where calling each other on cells after the police hits them and were “swarming” to a different rally point. Well, not so small and private—still large, but not thousands.